Apologies for the doom and gloom, dear reader. Now that I've recovered from my post-Sales high (more on which below), the January blues are kicking around like a houseguest who's overstayed their welcome. Only yesterday, I woke up, while it was still dark. Thinking it odd how refreshed I felt, considering it must only be 2 a.m., I turned on my torch and checked my snazzy new bedroom clock. Snazzy New Clock: Check It. It was 10 a.m. Now, I know it's winter, but I've lived through three decades' worth of winters and I don't ever remember having to turn the lights on at 10 in the frigging morning. Have millions of dolphins teamed up and pushed the UK further towards the North Pole? I demand to know! Turning briefly to the Sales frenzy. To mis-quote Mark from 'Peep Show', I did excellent shopping in the January Sales. I don't normally get swept up by shopping. The hysteria which surrounds the Next sale especially baffles me (for US readers: Next is a M.O.R. clothing & home store and their Boxing Day sale, which starts at 6 a.m., is the closest thing to Black Friday that we have in the UK). However, this year I appear to be suffering from severe Nesting Syndrome. I seem to remember, approximately 12 years ago, speaking to one of my housemates and swearing that I would never be the kind of person who owned cushions. But now, the Sales frenzy is over. I'm going to do the 'Tra-la-la, I'm not listening' routine when my credit card bill arrives next week, but I am happy about the fact that most of the above things were on my 'To Buy' list and I got some crazy bargains (interestingly, the best deals were to be had in Selfridges). It's now time to practice a little austerity for the other two weeks of January, so what else to do but to stay indoors and bake? Bake like your life depends on it! I knew instantly when this month's MacTweets was announced, that I would have to make Black Forest Macs. Black Forest Cake/Gateau was still the definitive fancy cake when I was small. Verified by the fact that along with the raspberry roulade and creme caramel, it always took the top shelf on the dessert trolley at my parent's favourite carvery (I miss carveries). As a kid, it was always a choice between a starter or dessert; never both, as I suffered from Eyes Bigger Than Belly syndrome. I always chose dessert and I always either had a hazelnut chewy meringue roulade thing, or Black Forest Gateau. Poor old Black Forest had a hard time of it in the UK in the 1980's, mainly thanks to those fiends of affordable frozen desserts, Sara Lee. But I am very happy to see it back on menus (and back in freezer cabinets; I liked Sara Lee cakes). I think we might have Good Old Heston to thank for that. I knew I had to have whipped cream in these macs, but I also knew that it would make the shells soggy if I wasn't careful. Putting cherry jam on one shell, ganache on the other and the cream in between, seems to work well enough. Go nuts on the jam seal, though. I only put a thin layer on the first few shells and these were soggy the next day. I am not going to post the recipe I used for the macarons. It was rubbish; I couldn't get the mix to 'flop', hence the slightly wonky appearance, caused by the little nubbins on each shell. I should've stuck with the Chocolate Mac Daddy, David Lebovitz. The Lebovitz link also gives you the recipe I used for the ganache, except I added 2 teaspoons of Kirsch and used golden syrup in place of corn syrup. Oh, and I used Green & Black's cherry chocolate, which at 60% cocoa content with bittersweet pieces of cherry, worked very well, once I worked out that I neeeded to make the tip on the icing bag wider, to stop the cherry pieces from clogging the bag. I melted the cherry jam down in a small saucepan and let it cool to tepid before spreading it on the shells. I let the jam and the ganache cool and set respectively, before piping four blobs of whipped cream onto the ganached shells, then assembled them with a quick dusting of icing sugar. 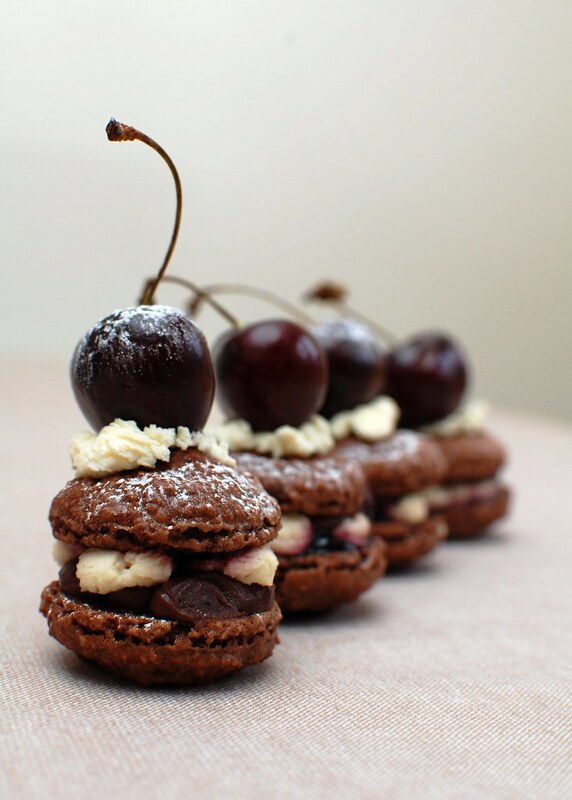 Now, if I can just work out how to use these macs to garnish an actual Black Forest Cake without getting soggy shells, I might just die and go to Heaven. I bet they get more daylight up there, too. And excellent shopping. What a great idea for dessert macs. The triple filling is killer. I've made my macs (chocolate) but am stumped what do with them. I could have done this but you've beaten me to it. Damn. I don't understand Next sales either. It was quite civilised when they started at 7am but now it's as early as 4am. I don't understand why they just don't start the day before and be done with it. Actually I do, having worked in Next I know that they always want to be able to say they've beaten their previous first day sales figures and they only way they can do this now is to open earlier and earlier as technically middle of the night is part of same trading day. So we can look forward to Next sales ultimately starting at midnight on Boxing Day. I feel sorry for the bloody staff, I hated working in the sale so much that after the summer sale I left before Christmas so it wouldn't ruin my holiday!! Love the Peep Show clip too, I only watched first 2 series but it's very funny and I don't know why I stopped watching. Love the Macs, and the clock and the birdhouse key ring! Want all three of them! I really think that the shops should be shut on boxing day too. It is so unfair on the staff that theey do not get a break. Who actually needs to go out and buy yet more stuff the day after Christmas? @Sarah My other dessert idea was to make chocolate cheesecake macs, but the call of the Forest was too strong. @Sarah & Helen I don't know what baffles more about Next, the fact that people queue up for fashions that were on the catwalks at least two years before getting into Next, or the sheer mentality of someone who would be prepared to get up to attend *any* retail event at 5am. I agree ref. the staff; I hope they get extra wages or some other decent incentive! YES PLEASE...these are just gorgeous Sarah. You are a lady after my heart! I love these, everything about them, the attention to detail, the cream between layers of jam & ganache.... I could go on & on! Thank you for baking with us again. You've inspired Mac-Inspiration with these beauties! This is baking therapy at it's prettiest best! @LadyMacaron20ten Aaw, thanks, Lady! Not quite as precise and glossy as some of the entries this month including your amazing 'eyeshadow' macs, but I had fun making them! @Deeba Macarons are tricky little things, but that's why we love them, yes? Because when they turn out well, the satisfaction is sweeter and the reward that much greater! @Lucy Thanks; the idea of puting the cherry top hats on them was a bit last minute, but I was quite chuffed with the touch of whimsy they added. Nice to see you back on your blog, btw. Your macarons are stunning! I love the cherry on top. I think French pastry chefs would even be impressed with your presentation. 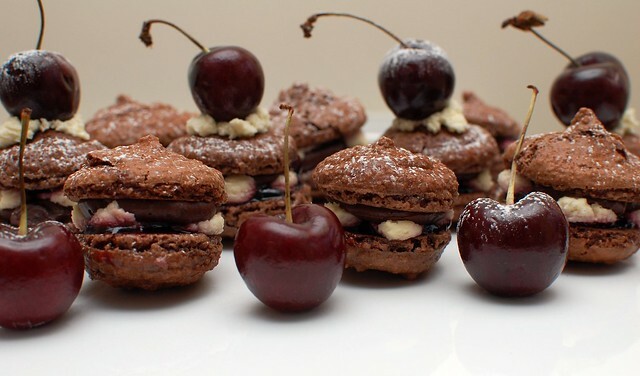 Loving the macaroons with the cherries! The butterfly clock is fab. The Next sale makes me laugh. I used to be there with the rest of them pre-child, but now I value my sleep too much! They are gorgeous! Absolute fabulous! Great idea, thanks very much. Aw, so cute with the cherries on top! Your delicious black forest macs are sure to chase any dark days away.